The buyer, an American entrepreneur living in Australia named David J. Davis, had entrusted trainer Harry Telford and his brother Hugh to make the purchase for him sight unseen. But when the high-withered colt arrived on Australian soil looking like an awkward warty-faced teenager, Davis refused to pay Telford to train the horse. Telford didn’t give up — he struck a deal with Davis to train the horse at no charge, receiving two-thirds of any race winnings. The colt was given the name “Phar Lap,” which is based on the Thai word for lightning, farlap. Telford changed it to a seven-letter name split in two words because he believed it would improve their odds of winning the Melbourne Cup. At this point two significant events occurred in Phar Lap’s life that would destine him for greatness. He was gelded, which probably helped him develop a better physique for racing. Geldings tend to grow taller than stallions and their necks have much less crest, lessening the weight on the front end of the horse. 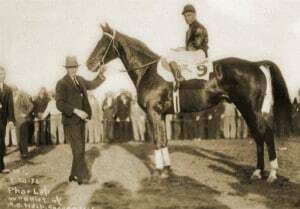 Sure enough, Phar Lap matured around 17 hands and his powerful back end showed great racing potential. The second stroke of luck was when Harry Telford hired Tommy Woodcock to serve as Phar Lap’s groom (known as a “strapper” in Great Britain and Australia). Woodcock was devoted to the gelding, spending every moment he could doting over the horse. 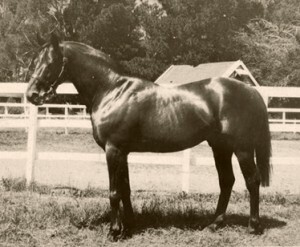 Phar Lap thrived in Woodcock’s care. In his first race, Phar Lap came in dead last, and he finished out of the money in his next three races. It looked like Telford, with a mediocre training record already, had another disappointing runner in his stable. Phar Lap won his fifth start but finished disappointingly in the next four races. He seemed to find his stride finally when he finished second in the Tattersall’s Chelmsford Stakes in April 1929, following up with 13 wins (including the coveted Melbourne Cup) and two third-place finishes later that year. Phar Lap’s four-year-old year was even more successful, with 14 wins and two second places in 16 races. As a five-year-old, Phar Lap won nine more races and finished out of the money just once, attributable to the 150-pound weight he was assigned by handicappers in the 1931 Melbourne Cup. His career record totaled 37 wins out of 51 starts. The nation turned to Phar Lap’s rags-to-riches story for inspiration during desperate times. By this time the Great Depression was in full swing and Australia was experiencing 30% unemployment. The nation turned to Phar Lap’s rags-to-riches story for inspiration during desperate times and the horse became a national hero when he won every major race in Australia. Trainer Telford now shared part-ownership of Phar Lap with Davis, who made the decision to send the horse to the U.S. in 1932 against Telford’s wishes. Telford stayed home but Woodcock made the journey with Phar Lap. Phar Lap’s first (and last) race abroad was the $100,000 Agua Caliente Handicap in Tijuana, Mexico — the largest purse offered in North America at that time. Phar Lap had developed a quarter crack in his hoof while still in Australia, so he couldn’t do much training for Agua Caliente after his arrival. 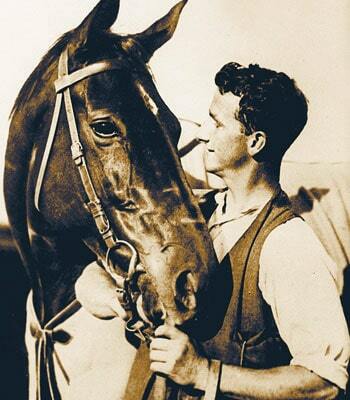 Woodcock walked Phar Lap everyday over sand dunes to keep the horse in shape. Despite the bleeding hoof wound, Phar Lap won the race pulling away from the other entries and setting a new track record. After Agua Caliente, Phar Lap was sent to Menlo Park, California, to rest and prepare for more races. Just two weeks after his triumphant debut in North America, Phar Lap developed severe intestinal distress and died in Woodcock’s arms within hours. He was five-and-a-half years old. Australians were shocked by the news that their hero was gone, with many suspecting foul play. One theory was that Phar Lap was poisoned, intentionally by a criminal element or accidentally in the form of pesticide-contaminated food or Fowler’s solution, a tonic made of arsenic that was often given to horses to stimulate appetite. The questions continued for 68 years until vets reviewed the necropsies (animal autopsies) performed on Phar Lap and surmised in 2000 that he died of an acute intestinal infection. But in 2007, technology had advanced enough to allow scientists to test hairs from Phar Lap’s mane and determine if the arsenic present in his tissues was administered prior to his death or used post-mortem in the taxidermy process. The results showed that Phar Lap was probably given a large dose of arsenic in the hours before he died, but it may never be clear whether it was intentional or accidental. Woodcock’s supporters don’t believe the devoted groom could have been responsible for Phar Lap’s death. Phar Lap was immortalized in the 1983 film bearing his name, which Tom Burlinson, the Australian actor who portrayed Tommy Woodcock, calls “one of the best films in which I’ve appeared.” View clips from the film and learn more about the horse who played Phar Lap in the movie. 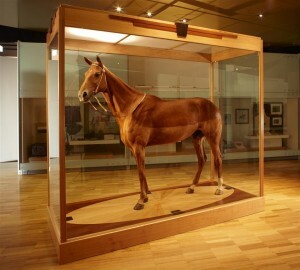 After Phar Lap’s death, his hide was sent to New York for preservation and mounting, then returned to Australia to be displayed at the National Museum of Victoria in Melbourne. His heart was removed and found to weigh 14 pounds, a remarkable size for racehorses of his time. In fact, it was the same size as the heart of the great Eclipse, putting him in a class of large-hearted horses that includes Secretariat and Man O War. Phar Lap’s heart can be seen at the Australian Institute of Anatomy in Canberra. His skeleton is on display at the National Museum of New Zealand in Wellington. Phar Lap’s sire, Night Raid, was not a great runner, but he sired a few good quality racehorses known for running long distances. The dam of Phar Lap, Entreaty, ran just one race without placing and was retired to the broodmare barn. 1) He was gelded at a young age and therefore grew bigger and developed a longer stride than if he’d been left intact. 2) He inherited the “x factor” from his dam, Entreaty, which gave him a heart that was larger than most Thoroughbreds. Eclipse, Entreaty’s ancestor, was the first Thoroughbred identified with this characteristic, and the gene was passed down through the generations on the x chromosome to Phar Lap. Horses with the “x factor” are more likely to have greater stamina, although it’s not a guarantee of racing success. 3) Phar Lap benefited from the devoted care he received from Tommy Woodcock. Phar Lap was gone too soon, but he’s far from forgotten after nearly 80 years. His heart is one of the most requested exhibits at the Australian Institute of Anatomy and Australians love visiting his exhibit at the National Museum of Victoria. Despite the fact that he was taxidermied with sawdust and ropes in 1932, Phar Lap looks like he could walk out of the glass enclosure and drop his head into your hands. You can read more about how Phar Lap was mounted in this 1932 Popular Science article.